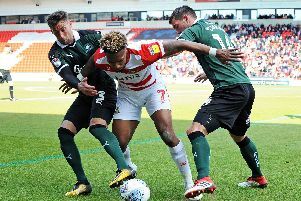 Grant McCann wants in-form Doncaster Rovers to get into ‘credit’ as they enter a potentially pivotal stage of the season. Sixth-placed Rovers are among seven teams who have broken away at the top of League One. Now McCann, whose side travel to Wycombe Wanderers this weekend, has challenged his team to cement a top six spot over the course of the next ten games. Rovers are currently just one point clear of seventh-placed Peterborough United. “We’ve got a bit of credit from eighth place,” said McCann. “They’re seven points behind us. “But we want to try and get a bit of credit so we’re in the top six and we can lose a game and not drop out of it. “That’s our focus for the next 12 games, to make sure we get as many points as we can. “This 12-game cycle is really important. “We’ve started it well, with wins against Gillingham and Rochdale. Doncaster have won nine of their last 12 games in all competitions. And confidence soared last weekend when Rovers did a very professional job at Preston North End to knock the Championship side out of the FA Cup. “Winning breeds confidence and it gets the best out of players even more,” said McCann. “But the players have got a real belief in terms of just winning the game. “There’s games where we probably haven't been at our best and won. “And there’s games where we’ve been good and won. “It’s about making sure we have every aspect of it to win a football match. Do whatever it takes. “But one thing I am pleased about at the moment is the level of performance. “You have to perform to win. We always focus on performance first. If we don’t win but the performance is good we can take that. Niall Mason could be back in the squad but Joe Wright is not ready to return.